2-Way Voice (AngelCall) on the GPS 2 includes a rich set of options to control the experience when you call, to adjust to different children and sensitivity levels. Ringtone: The ringtone sound on the device when you call. Vibrate: Ability to have the device also vibrate when it rings to alert your child to the incoming call. 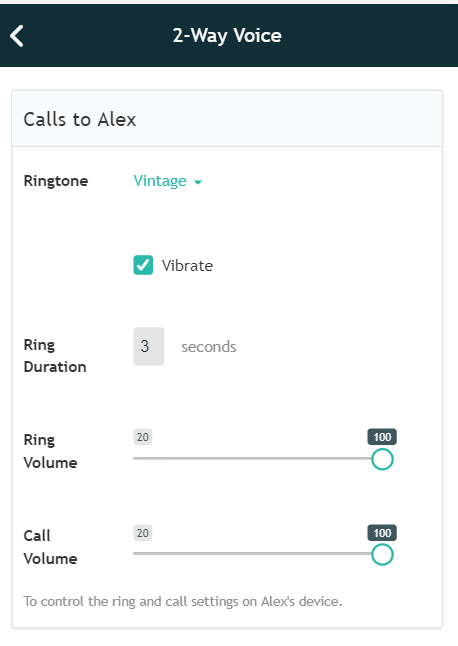 Ring Duration: How long you want the device to ring before automatically answering. Ring Volume: The volume of the ringtone when it rings. A louder ringtone can ensure your child is alerted to your incoming call. Call Volume: The device's speaker is turned on automatically and in this setting you control its volume during the call. It is suggested to keep the call volume at 100% to help your child hear you speaking to them. This can be accessed from your app's main Menu on the left hand side by clicking on Settings and 2-Way Voice.